· Altitude Stabilization (Suspension) function - Easier flight mode for beginners or children: the mode means that the drone stays at a fixed flight altitude by air pressure. By activating this mode, the drone can fly at a predetermined height. You can move it in any position quickly and take pictures in any corner, it is the most suitable control for beginners. · Alarm out of flight range - To prevent drone loss: when the drone departs from the recommended flight range, the transmitter will beep...... didi didi... in alarm state, the drone must be flown in a controllable area, otherwise the drone will be out of control and will be lost. · Headless Mode - No more confusion about direction, especially for children who are particularly insensitive to directions. By activating headless mode at the start of the flight, it is not necessary to distinguish the direction of the drone, and you can more easily pilot the drone. 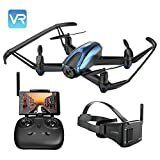 · FPV RC drone with high resolution video camera - 720P HD camera with a wide angle of 120 degrees thanks to HOVER mode and VR mode Version, which can facilitate the realization of selfie and the need for VR Version. Whether for mountaineering, hiking or family parties, it can help you capture every moment eternally. · Potensic Drone Features: Easy control and stable flight: Unlike the other drones, you will not need to practice on throttle control, due to altitude suspension mode, the drone will be easy to operate at altitude once the stick returns to the center. It also has a take-off / landing / EMERGENCY STOP button.720P HD real-time transmission camera: Unlike normal drones with so-called HD cameras, it is equipped with a real 720P HD camera and a large angle of 120 degrees. The quality of Live View reaches 720P, if not compared to advanced drones, its performance is quite good.With VR glasses: Click on the VR icon to activate the split screen mode of the mobile. Use VR glasses to enjoy real-time viewing of the transmission in 3D. Package contents: 1 x Drone Potensic1 x Glasses VR1 x Control with FPV1 display x USB cable to charge the battery8 x Propellers 2 x Battery 1 x Manual in Spanish Attention: Not suitable for children under 14 years. It should be used under the supervision of an adult.The radius of the flight should be within 30M to avoid the risk of losing the dron.Use under the direct supervision of an adult.